Halloween - a time of spooky decorations and dressing up in costumes for the chance to thrill and chill friends and neighbours—yet sometimes the scary efforts of some Halloween celebrators go too far. Consider the case of a young man attempting to pull off a fake hanging and fatally failing in the attempt. In most cases an Urban Legend is a story that sounds too incredible too fantastic to be true. In some cases the urban legend is based on a true story, but the facts of the story have been augmented or in some cases left out in order to make it more fantastic. In this case, the urban legend turns out to be true at every angle. It is possible that some of the stories told about people accidentally hanging themselves when trying to pull off a Halloween stunt are copy cat stories, imitations of the real events, but there are more than a few documented cases of actual accidental deaths on Halloween. Many of them involve the “hay ride” type attractions- sort of mobile haunted houses, a hay ride takes a load of passengers in the back of a wagon –pulled by horse or tractor- along a country path or farm with various stops along the way. These stops are invariably manned by people whose job it is to scare those in the wagon, by jumping out and saying “boo” in all manner of creative ways. One traditional stop is the hanging man. 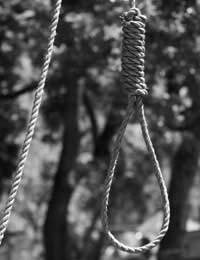 A lone gallows will be set up, and a noose made from the rope, but not a typical hangman’s noose. This loop is secured so that it will NOT slip and tighten, and in many cases the person is actually suspended by a harness around the chest and under the arms, hidden by a jacket. Some cases involve just the noose, but the person’s feet are hidden as they are actually standing safely on the ground. Every so often something goes wrong. Either a youngster sets it up themselves without proper supervision and unintentionally creates a death trap, or they use a rope that was set up to hold a mannequin. In one case organizers realized something was wrong when a teenager in the “hanging man” station remained silent when the hay ride passed by, failing to give the traditional speech. A few years back there was another story reported of a Halloween decoration in poor taste- a hanging body in full view of a busy highway. Motorists sped by and went about their day, assuming it was just some prank in honour of the season, but eventually someone notified police. Upon investigating the scene hours after the first sighting, it was discovered that a middle aged woman had committed suicide by hanging, apparently picking the particular spot specifically for the view.